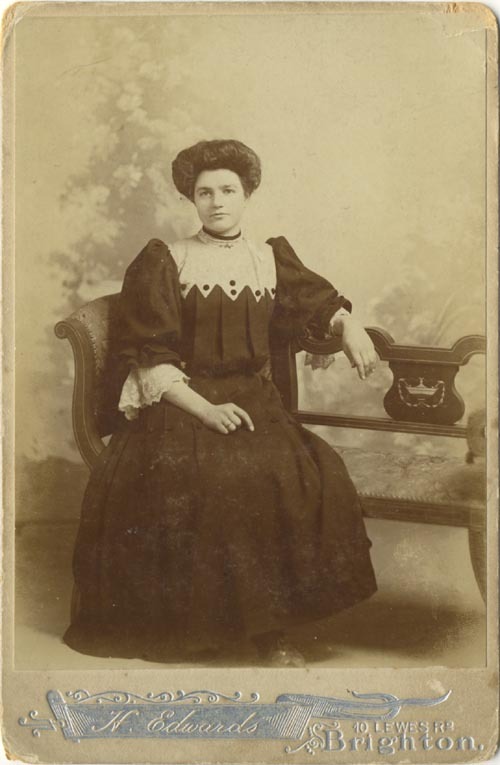 The small carte-de-visite photograph dominated commercial portrait photography for most of the Victorian period. The idea of a larger format for portrait photography was put forward by the London photographer Frederick Richard Window in 1866. The proposed format was a photographic print mounted on a sturdy card measuring 41/4 inches by 61/2 inches. (roughly 11cm x 17cm). 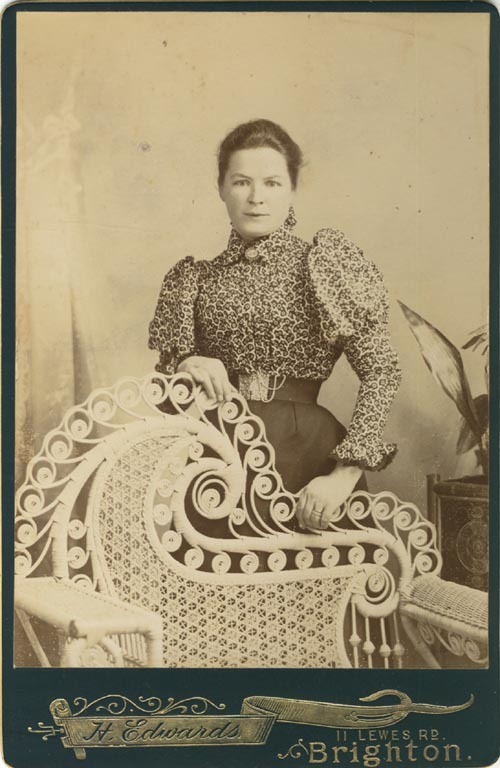 The new format was called the Cabinet Portrait, presumably because a large photograph on a stout card could be displayed to good effect on a wooden cabinet or similar piece of furniture. Landscape views on card mounts of a similar size had been produced as early as 1862, but F. R. Window had introduced the cabinet format specifically for portraiture. Window believed the larger dimensions of the 'cabinet print' (4 inches by 51/2 inches or approximately 10.2 cm x 10.2 cm x 14.1 cm) would enable the professional photographer to demonstrate his technical and artistic skill and produce portraits of a higher quality than the small carte-de-visite would allow. Although introduced in 1866, the cabinet portrait did not really establish itself until after the invention of dry plate photography and the reduction in plate exposure times to a fraction of a second. The arrival of "instantaneous photography" around 1880 allowed the cabinet format to be used to its full potential. 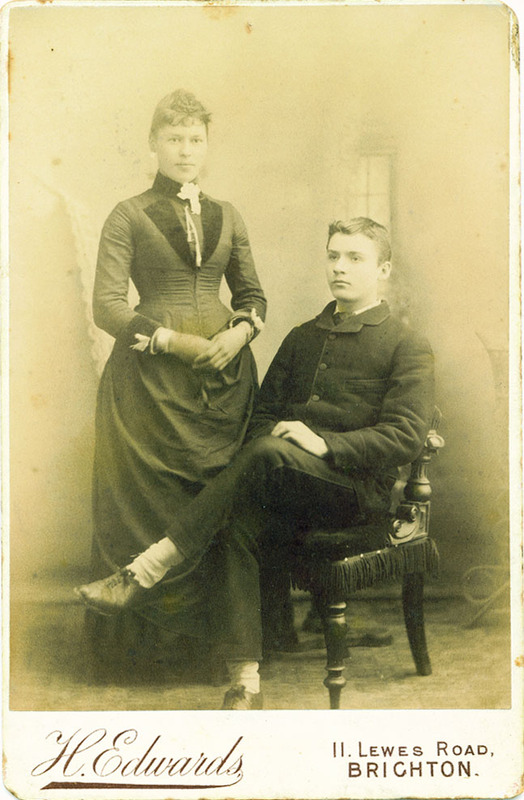 The cabinet photograph increased in popularity in the late 1880s and 1890s, as the demand for carte- de-visite portraits declined. 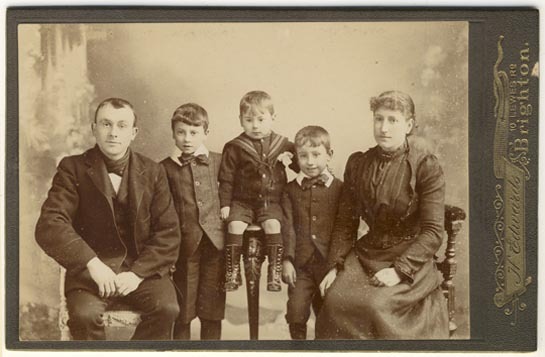 Much larger than the carte-de-visite, the size of the cabinet format made it particularly suitable for groups and family portraits. 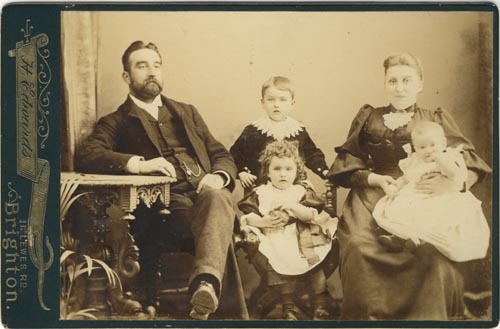 The introduction of "instantaneous photography" ensured that even restless and fidgety children in family groups could be captured sharply by the camera. 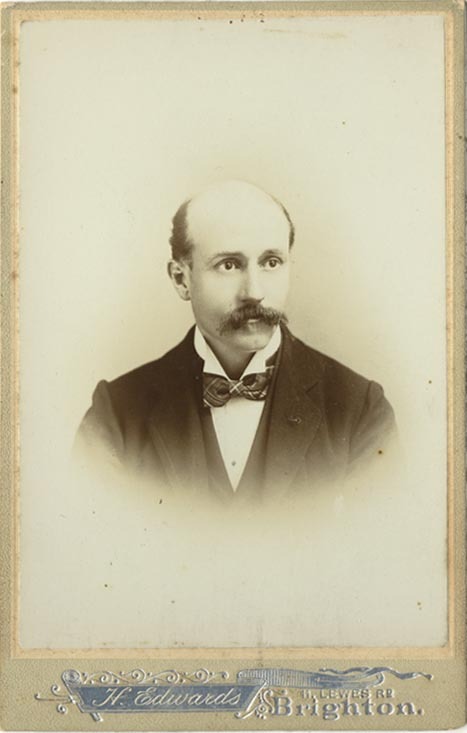 [ABOVE] A portrait of a man with a moustache. A cabinet format photograph by Henry T. Edwards of 10 & 11 Lewes Road, Brighton. Negative No.24,216. (c1901). 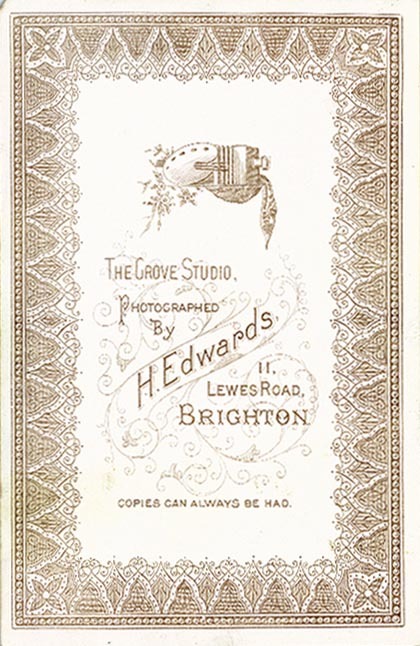 The studio address is given as 11 Lewes Road at the foot of the photograph, but 10 Lewes Road on the reverse of the cabinet card. [ABOVE] The reverse of the cabinet portrait pictured above, produced by Henry T. Edwards of 10 & 11 Lewes Road, Brighton. Negative No.24,216 (c1901). The address on the trade plate reads 10 Lewes Road, Brighton. [ABOVE] A portrait of a seated young woman. A cabinet format photograph by Henry T. Edwards of 10 Lewes Road, Brighton. Plain back. Negative No.41,648 (c1907). From around 1900 onwards, the studio address is given as No. 10 Lewes Road, Brighton instead of No. 11. Nos. 001-500 (London Rd) Grey-coloured mount with silver banner & silver lettering. Back decorated with "cherub artists" design & black ink lettering. 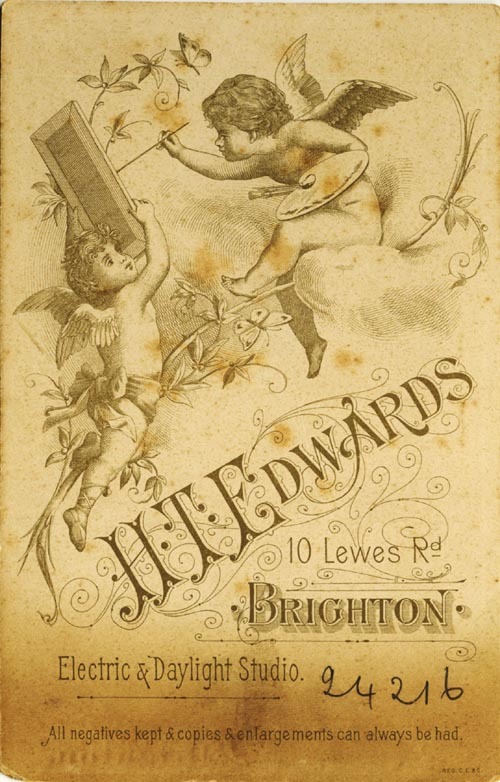 Cartes have serrated (tooth-like) edges H. T. Edwards, Electric & Daylight Studio, 10 Lewes Road & 12a London Road, Brighton. Nos. 30,,000 - 37,000 Cartes. Light-grey or cream coloured mount with gold banner & gold lettering. Plain back H. Edwards, 11 Lewes Road, Brighton. Nos. 33,,000 - 35,000 Olive-green coloured mount with gold banner & gold lettering. Elaborate filigree on edge of banner. Plain light-grey back. 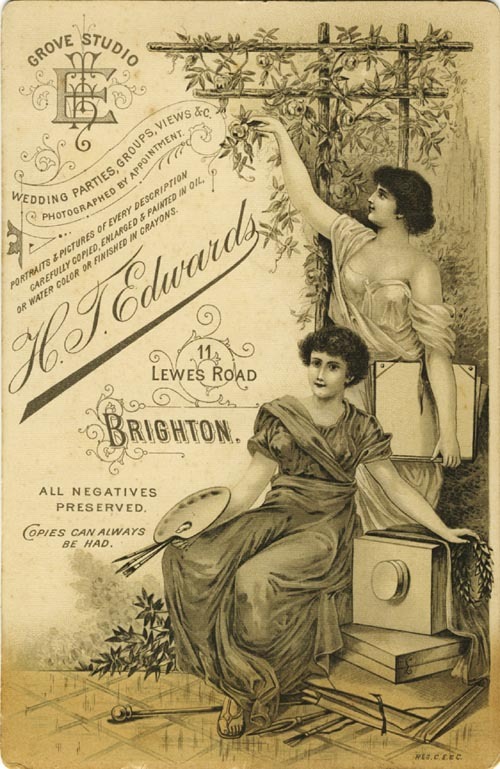 H. Edwards, 10 Lewes Road, Brighton. [ABOVE] A family group portrait. A cabinet photograph by H. Edwards of 10 Lewes Road, Brighton. Negative No.33,986. (c1904). 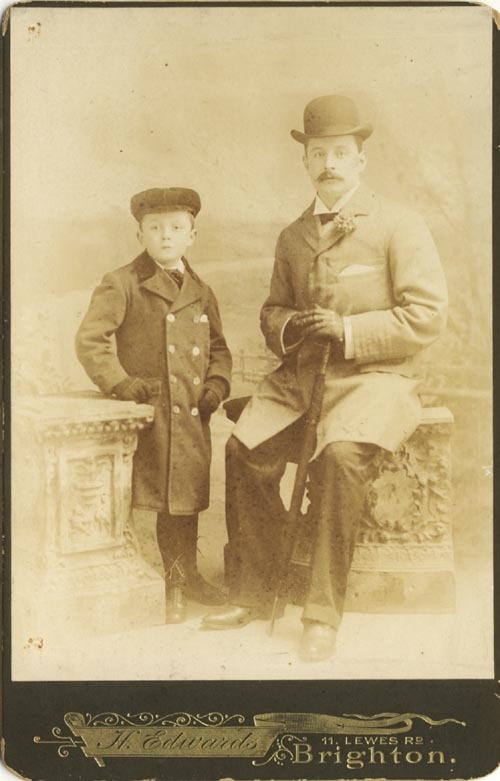 Photographs produced by Henry Edwards after 1901 generally carry the new studio address of No. 10 Lewes Road, Brighton rather than No. 11 Lewes Road, Brighton. The olive-green mount is made of slightly thicker card and has an embossed rather than plain surface. 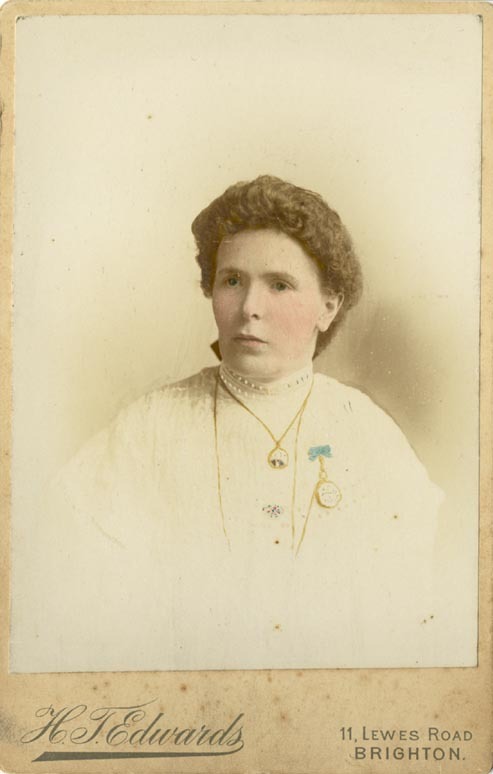 The reverse of the cabinet card is plain grey and blank, without a trade plate design. Thanks to Brian Dungate for providing the cabinet portrait of his grandparents. Thanks also to Dennis Parrett for providing a cabinet portrait by H. T. Edwards of Lewes Road, Brighton.